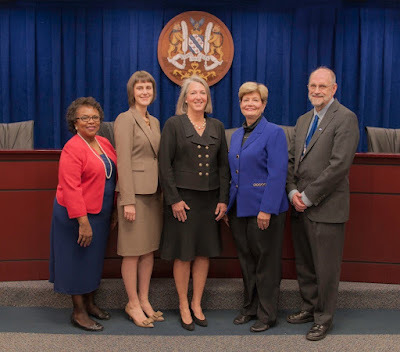 Rockville City Manager Barbara Matthews has now added oversight of purchasing by the City to her long list of responsibilities, after the Mayor and Council adopted a change recommended by a consulting firm. This was one of the more significant adjustments the report by Calyptus Consulting suggested. The City Council voted last October to delay implementation of the report's recommendations 90 days, in part to give Matthews the opportunity to get her staff up to speed to take on the new authority. “I want to commend the city manager for her decision to accept the consultant’s recommendations that the purchasing division report directly to her," said Jack Kelly, chair of the City's Financial Advisory Board at Monday night's meeting. "I believe that this was the correct decision.” Mayor Bridget Donnell Newton also thanked Matthews, adding, "you have helped the Mayor and Council greatly." After a recap of the report and discussion, the Mayor and Council voted unanimously to move purchasing oversight to the City Manager's office. Kelly called the move "a great start," but he had some concerns that two other recommendations - the creation of service level agreements and targeted improvement plans - were not getting enough attention. “It’s not been easy, but it has been well worthwhile,” Newton said of the delayed reform.